On March 24, the “Day of Blood,” her [Cybele] chief priest, the Archigallus, drew blood from his arms and offered it to her to the music of cymbals, drums, and flutes, while the lower clergy whirled madly and slashed themselves to bespatter the altar and the sacred pine with their blood. The Bagobos of Mindanao, one of the Philippine Islands, used annually to sacrifice human victims for the good of the crops in a similar way. Early in December, when the constellation Orion appeared at seven o’clock in the evening, the people knew that the time had come to clear their fields for sowing and to sacrifice a slave. The sacrifice was presented to certain powerful spirits as payment for the good year which the people had enjoyed, and to ensure the favor of the spirits for the coming season. The victim was led to a great tree in the forest; there he was tied with his back to the tree and his arms stretched high above his head, in the attitude in which ancient artists portrayed Marsyas hanging on the fatal tree. While he thus hung by the arms, he was slain by a spear thrust through his body at the level of the armpits. Afterwards the body was cut clean through the middle at the waist, and the upper part was apparently allowed to dangle for a little from the tree, while the under part wallowed in blood on the ground. The two portions were finally cast into a shallow trench beside the tree. Before this was done, anybody who wished might cut off a piece of flesh or a lock of hair from the corpse and carry it to the grave of some relation whose body was being consumed by a ghoul. Attracted by the fresh corpse, the ghoul would leave the moldering old body in peace. These sacrifices have been offered by men now living. It is significant that ever since the days of Babylon, a period of almost four thousand years, this accusation (like many others) has been leveled against the Jews everywhere they have ever resided in the world. Time and again down through the ages the Jews have been caught literally red-handed, in some cases toting the dead body of the child whose blood they have drained away to dispose of it in sacks or wagons, sometimes with the corpse being found in the synagogue cellars, etc. The Jews’ response to this is “ve is beink poisecute!” They maintain that down through forty centuries of history, there has been a mammoth conspiracy to frame them for ritual murder. According to this theory, in places as far apart as Cochin China, medieval Germany, 1913 Kiev and 1970 Montreal, and among peoples as diverse as knightly Crusaders, Turkish sultans, twelfth-century Yorkshire Saxons, Argentinians, Cossacks, British historians, Renaissance Italian popes, assorted saints and sinners, the burgomeisters of Prague, and modern-day Arabs, there exists one big long, continuous plot periodically to murder small children, drain them of blood, and plant the bodies on Jewish premises or in Jewish vehicles, etc. That’s one hell of a conspiracy. There is a reckoning coming, a reckoning between humanity and the Jewish people which will cause the very heavens to darken and the very devils in hell to hide their faces in shock and terror. MARSYAS was a Phrygian Satyr who first composed tunes for the flute. He obtained his instrument from Athena, who had invented the device but discarded it in her displeasure over the bloating effect on the cheeks. Later, in hubristic pride over the new-found music, Marsyas dared challenge the god Apollon to a contest. The Satyr inevitably lost, when, in the second round, the god demanded they play their instruments upsidedown–a feat ill-suited to the flute. As punishment for his presumption, Apollon had Marsyas tied to a tree and flayed him alive. The rustic gods in their pity then transformed him into a mountain stream. The story of Marsyas’ musical contest with Apollon was sometimes applied to the Arkadian god Pan. The satyr was also connected with the flute-playing Tityroi which formed part of the train of the god Dionysos. 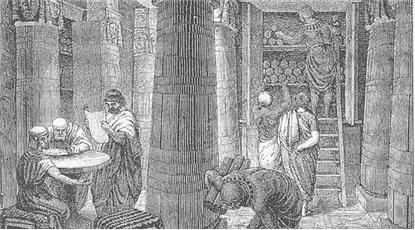 THE TITYROI (or Tityri) were flute-playing rustic daimones in the train of the god Dionysos. They were related to the tribes of Satyroi, Seilenoi and Lenai, and like those Daimones were depicted as furry little men with assine ears, pug noses, and tails. The name Tityros appears to be derived from tityrinos, a double shepherd’s pipe. According to Eustathius (1157. 39), Tityros was simply the Doric word for satyr. There was also a Mount Tityros near Kydonia in Krete. The bucolic poets often use the name for a rustic character. The Boeotian giant Tityos, who attempted to violate the goddess Leto and was slain by Apollon, may have been have originally have been imagined as one of the Tityroi. These are the same qualifications required for today’s initiates of sexual magick. The boys are sodomized and slowly tortured to death in some cases; flaying is a particularly good device to placate demons. All of this is mentioned by Aleister Crowley as recommended ritual human sacrifice in his books on Abremelin [Arabic] Magick. [iii] Satyricon LXIII. ; Lucan, Bellum Civile VI. 557-558.; Aelius Lampridius, Diadumenus Antoninus IV. 2. ; Pliny, Epistulae VI. 2, 2.; In Vatinium XIV. ; Apologia I. 18. ; Aelius Lampridius, Heliogabalus VIII. 1-2; Macrobius, Saturnalia I. 7, 34-35.; Apuleius, Apologia XLII-XLIII. ; Gellius, Noctes Atticae I. 12. [iv] This volume brings together articles on the cult of the mother-goddess Cybele and her consort Attis, from the emergence of the religion in Anatolia through its expansion into Greece and Italy to the latest times of the Roman Empire and its farthest extent west, the Iberian Peninsula. It combines the work of established scholars with that of young researchers in the field, and represents a truly international perspective. The reader will find treatment “inter alia” of Cybele’s emasculated priests, the Galli; the dissemination of Cybele-cult through the harbour city, Miletus; the cult of Cybele in Ephesus; the rock-cut sanctuary of Cybele at Akrai in Sicily; the competition between the Cybele-cult and Christianity; and the role of Attis in Neo-Platonic philosophy.